The following post is originally from Dan Mitchell's blog International Liberty and because I enjoy reading his daily musings, I thought you'd all enjoy this one, too! Over the years, I’ve repeatedly tied to explain why socialism is a terrible system while also explaining that we should be careful not to label people as socialists if it’s more accurate to refer to them as statists, redistributionists, cronyists, orfascists. To help illuminate this issue, here’s a four-quadrant matrix. Free markets are on the left and state planning is on the right. And small government is on the top with redistribution is on the bottom. So it’s a very good idea to be in the top-left quadrant, hopefully close to the corner, sort of like Hong Kong and Singapore. And it’s a big mistake to be in the bottom-right quadrant, sort of like Cuba, North Korea, and Venezuela. Notice, by the way, that Denmark and Sweden are more free market than the United States (i.e., further to the left), but with much more redistribution (i.e., closer to the bottom). 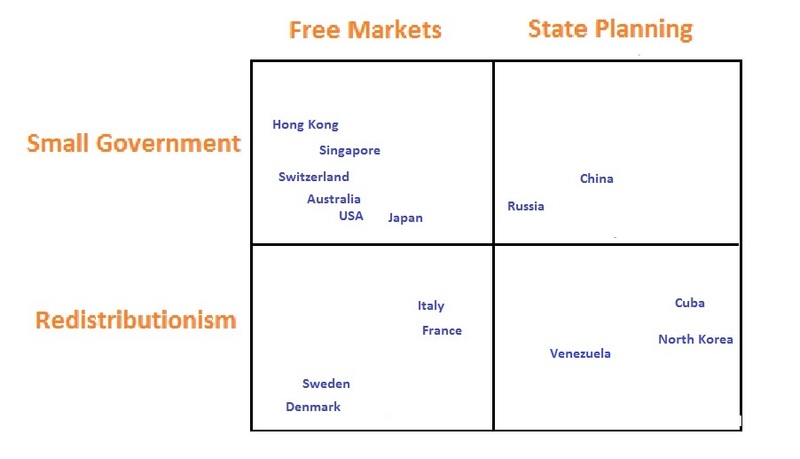 Which is exactly what you see when you look at the underlying data from Economic Freedom of the World. Let’s augment our four quadrants by adding a couple of historical examples, which are colored red. In the top left quadrant, we have the United States in the late 1800s, which is when we had a public sector that was significantly smaller than what Hong Kong has today. Heck, nations such as France and Sweden also had very small governments in the 1800s, which is when the western world became rich. I also added the National Socialists from 1930s Germany. Their fascist economic system retained the veneer of private ownership, but state planning was the dominant economic model. Moreover, it would be very illuminating to have a three-dimensional matrix in order to capture the difference between cronyism/interventionism and socialism/state planning. Both involve government officials exercising power over the allocation of resources, of course, but cronyism/interventionism tends to be ad hoc and morally corrupt while socialism/state planning tends to be systemic and intellectually corrupt. Though if a government engages in enough cronyism/interventionism (thinkVenezuela), the net result looks a lot like socialism/state planning (think North Korea). Or maybe we should have a four-dimensional matrix so we also can distinguish between systems with nominal private property (such as fascism) and ones where the government owns the “factors of production” (such as socialism and communism). The unfortunate reality is that there are several strains of statism, all of which are bad. By the way, one of Hillary Clinton’s advisors, Gene Sperling, was recently asked about the difference between a socialist and a Democrat and was accused of dodging the question just like Hillary (and, I would add, Debbie Wasserman-Schultz). “I’m not here to do general definitions,” replied Gene Sperling, a Hillary Clinton economic adviser, when asked by MSNBC: ‘What is the difference between a socialist and a Democrat?’ MSNBC’s Chris Matthews stumped Hillary Clinton with the same question several months ago. Though, if you watch the interview, I think Gene actually gets close to the truth. He said Hillary was a “progressive” (which presumably means lots of redistribution), but nonetheless supports the market economy (as opposed to state planning). To be sure, there are many examples of Hillary wanting to engage in interventionism, so Sperling may be right about socialism but wrong about Mrs. Clinton. Let’s close with a video on socialism from Dennis Prager, though it applies equally to redistributionism (or any system where people can use the coercive power of government to obtain unearned goodies). One of the most insightful parts of the video was when Dennis pointed out that excessive government weakens character. Which is just another way of pointing out that statism erodes social capital. And I fear he’s right that regaining and restoring character is not that easy. Once people have decided that it’s morally acceptable to use the power of government to take what other people have produced, restoring an ethical society is probably like putting toothpaste back in a tube. Which explains why I am so miserably pessimistic about the future of places such as Greece. For more articles like this one, visit Dan's blog here: https://danieljmitchell.wordpress.com/.